18329 NETSP2709.jpg 500X638\NETSP2709.jpg Send A Hint! 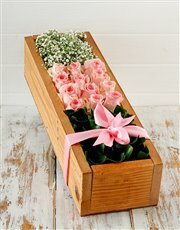 Product Description: less text There really is something so exciting about receiving a jam-packed crate, expecially when it's filled with gorgeous pink roses which are complemented with refreshing ruscus plants and million star flowers. This Pink Wonder Crate is finished off with a pink satin ribbon, making it the perfect flower gift for any occasion. Send now with NetFlorist! Get this Pink Wonder Crate delivered with NetFlorist.